We can learn a great deal from good leadership but we can also learn from poor leadership. I’ve been fortunate to have experienced some really great leaders, but I’ve also suffered my fair share of real duffers. In a world that increasingly asks us to embrace change and inspire innovation I’ve nailed down my top four fatal flaws of poor leadership, and on the flip slide what good leaders can do to avoid them. 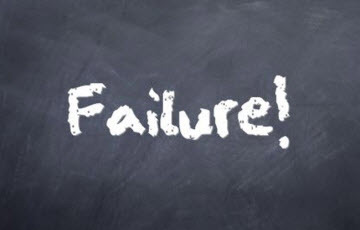 They are: avoiding failure (at all costs), blaming others, denying failure and failing to decide. Study projects that do not work out and gather as many insights as possible from them. When something doesn’t go as planned, it’s an opportunity to challenge your assumptions and adjust accordingly. Record your insights and share them across your team or organisation. It can be a good idea to bring senior leaders together on a regular basis to talk about their failures, with a clear emphasis on learning. You could even try celebrating failure! Several firms already do this: NASA has a Lean Forward, Fail Smart Award; and the Tata Group has a Dare to Try Award. An associated tendency among poor leaders is to shift the blame when things go wrong. The danger here is that blame blocks learning. In the first place, blame stops further investigation. Second, direct reports will only be open and honest about their own failure if they trust their leaders to be fair, honest and diligent themselves. The risk is a circular firing squad, with everyone pointing the finger at someone else. An additional problem is that blame and disciplinary action are often seen as a way of instilling greater diligence and motivation, under the banner of: “you can’t let people get away with it.” Yet in hospitals high rates of disciplinary action have been found to reduce the reporting of errors, which in turn leads to an increase in actual errors because there is no opportunity to learn from them. Both of these flaws are perhaps not surprising given that failure denial is deeply embedded in our cultures and personalities. When confronted with evidence that challenges our deeply held beliefs we are more likely to reframe the evidence than we are to alter our beliefs. We simply invent new reasons, new justifications and new explanations. Sometimes we ignore the new evidence altogether. This protects our self-esteem and helps us live with ourselves. In ‘When Prophecy Fails’ Leon Festinger related the story of how he and a colleague infiltrated the cult of Dorothy Martin, based in the suburbs of Michigan USA, who predicted the world would end on 21 December 1954. When it didn’t happen, contrary to Festinger’s expectations, cult members became even more fervent in their belief, believing that they had saved the world. They changed their interpretation to fit the new facts. Festinger called it ‘cognitive dissonance’. As Napoleon observed, ‘Nothing is more difficult, and therefore more precious, than to be able to decide.’ But if the risk of choosing incorrectly is failure you can understand why poor managers defer, delay and avoid decisions. The remedy is to be thorough and to seek feedback. It’s not fool proof, but nothing is and that’s the point. Gather as much data as you can, but beware the law of diminishing returns: data will always be incomplete. Check the factual accuracy of information. Check your own and other’s reasoning, is it logical and consistent? Is it free of incorrect assumptions, wishful thinking, errors in calculation and underestimation of risk? Don’t be afraid to use your intuition (tacit knowledge) to make sense of the situation. Always carry out a post-decision review to identify errors in your decision making process. It’s also worth remembering that delaying a decision or not making a decision are decisions in their own right. The common thread running through these flaws is ‘avoidance’: if I don’t decide and don’t act I can avoid risk; and if all else fails I can deny that I failed, or blame someone else. It is a status quo mentality utterly unsuited to an environment where change is ever present and innovation is key. In this context, playing safe is the riskiest thing a leader can do. To paraphrase William O’Brien, it is better to have tried and failed, and learned from it, than never to have tried at all.